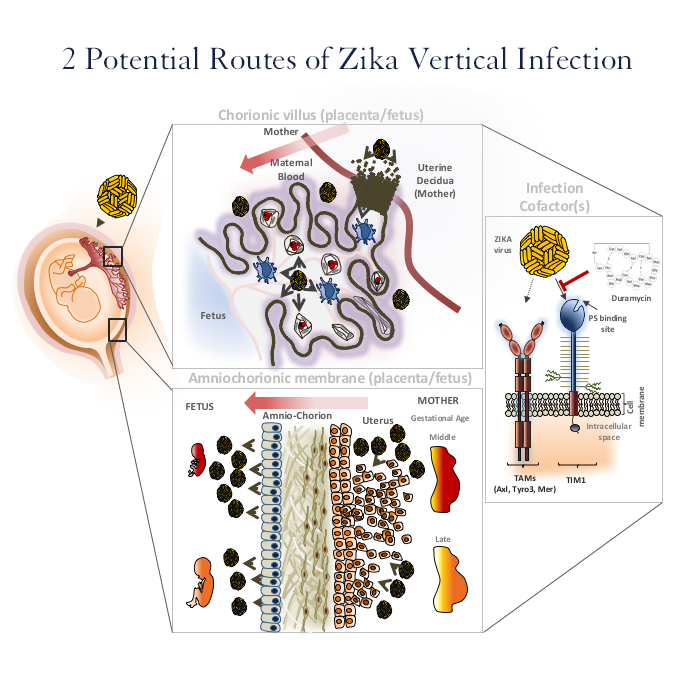 Zika virus can infect numerous cell types in the human placenta and amniotic sac, according to researchers at UC San Francisco and UC Berkeley who show in a new paper how the virus travels from a pregnant woman to her fetus. They also identify a drug that may be able to block it. The virus has two potential routes to the developing fetus: a placental route established in the first trimester, and a route across the amniotic sac that only becomes available in the second trimester, according to the study, published Monday, July 18 in Cell Host & Microbe. The study of human tissue in the laboratory found that an older generation antibiotic called duramycin blocked the virus from replicating in cells that are thought to transmit it along both routes. Duramycin is an antibiotic that bacteria produce to fight off other bacteria. It is commonly used in animals and is in clinical trials for people with cystic fibrosis. Recent studies have shown it to be effective in cell culture experiments against dengue and West Nile virus, which are flaviviruses like Zika, as well as filoviruses, like Ebola. The virus infects several different placental cell types when examined in isolated cells and as intact tissue explants. These include cell types within the placenta and outside the placenta in the fetal membranes. The scientists found that the epithelial cells of the amniotic membrane surrounding the fetus were particularly susceptible to Zika virus infection. Zika virus also uses other receptors, including Axl and Tyro3, which are found in various placental cells. However, the investigators found that only TIM1 was strongly and consistently expressed in placental cell types throughout gestation. TIM1 binds to phosphatidylethanolamine (PE), a membrane lipid present in the Zika virus envelope that is also present in dengue, West Nile and Ebola. Duramycin, a 19-amino acid cyclic small molecule, binds to PE in the virion envelope, and by doing so it can block these viruses from latching onto the TIM1 receptor to get into cells. The scientists found that duramycin blocked infection of all the placental and fetal membrane cell types they tested, including cytotrophoblasts and amniotic epithelial cells, as well as chorionic villus explants. What’s more, the infection was substantially blocked at relatively low concentrations of the drug. Other authors of the paper include Takako Tabata, PhD, Matthew Petitt, PhD, and June Fang-Hoover, of UCSF; and Henry Puerta-Guardo, PhD, Daniela Michlmayr, PhD, and Chunling Wang PhD, at UC Berkeley. The research was funded by the National Institute of Allergy and Infectious Diseases. UCSF is a leading university dedicated to promoting health worldwide through advanced biomedical research, graduate-level education in the life sciences and health professions, and excellence in patient care. It includes top-ranked graduate schools of dentistry, medicine, nursing and pharmacy; a graduate division with nationally renowned programs in basic, biomedical, translational and population sciences; and a preeminent biomedical research enterprise. It also includes UCSF Health, which comprises top-ranked hospitals, UCSF Medical Center and UCSF Benioff Children’s Hospitals in San Francisco and Oakland – and other partner and affiliated hospitals and healthcare providers throughout the Bay Area.